Industrial floor cleaning equipment is used where man power is not fast or efficient enough in cleaning large areas and where waste may often be toxic or hazardous and unsuitable for humans to clear. Even menial tasks like sweeping and mopping can be automated with the appropriate equipment and these mechanical sweepers are much faster than a person with a broom and can sweep up to 200 m2 per hour. 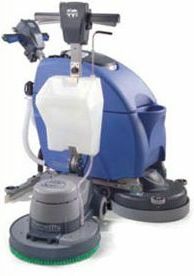 Numatic® is an internationally renowned manufacturer of such floor cleaning equipment. Numatic’s smallest scrubbers normally use 33 cm brush fittings with a typical operating speed of 200 revolutions per minute; these units are compact and very easy to manoeuvre, usually weighing less than 20 kg. Scrubbers can deep-clean even structured floors with a vigorous scrubbing action when the appropriate scrubber fitting is used; larger models use brushes up to 40 cm in diameter. Depending on the brush fitted, these scrubbers can also be used for rotary carpet cleaning and for polishing floors to a deep sheen. Scrubber-driers are one step up in industrial floor cleaning equipment, as they dry the floor at the same time. Some of these are walk-behind units, but the ride-on models are more convenient and can clean larger areas at a time; more than 1,500 m2 per hour, in fact. Other scrubber-drier models include industrial floor cleaning equipment like Numatic’s escalator cleaners, which can even clean an escalator while it is running. However, for small offices and premises, the Numatic® TT 1535 S is ideal with its low 38 kg weight and 15-litre clean tank. It still boats a 1,000-Watt motor and with water pickup nozzles on either side, it allows for multi-directional operation. For more information on the industrial floor cleaning equipment from makers like Numatic®, Santoemma® and Kärcher®, contact us. This entry was posted in Industrial Cleaning Equipment and tagged industrial floor cleaning equipment, Numatic by admin. Bookmark the permalink.